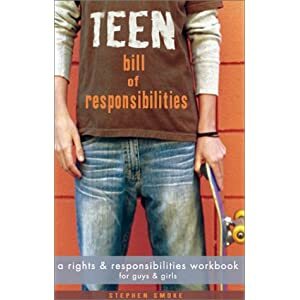 This book uses a workbook format to make the connection between rights and responsibilities. The author describes three ways to use the book: Read and use the workbook on their own, read parts of it aloud and discuss it with friends, and take the TBOR course which is available for free to middle and high schools (see their website for more info). The book is divided into sections such as “My Life”, “My Body”, and “My Friends”. It then uses couplets to make associations, such as “I have the right to express myself” followed by “I have the responsibility to realize I do not have the right to express myself when that expression infringes on the rights of others”. Included in each section are blank sections where the reader is encouraged to write their own rights and responsibilities. With these couplets positioned on opposing pages in large type, nearly any teen will be able to read through this book in no time at all. Reading on their own, teens may get little more than exercise rolling their eyes. But under the adult guidance of a teacher, these simple couplets can become the starting points of meaningful conversations, classroom discussions or creative writing exercises. Published by Jodere Group, Inc. ISBN 1-58872-079-9, 183 pages, paperback.